Apart from the Newspapers and Official Website, the J&K Bank vacancy Details are also published on Popular Job Portal of J&K Jobs in Jammu . Interested candidates who are the natives or Permanent Residents of J&K State are required to go through the Complete Details and ensure that they full fill the Eligibility criteria before applying Online for the exam. Moreover, J&K Bank has also made some Big Chances in the Pattern and Scheme of Examinations. Here is the Latest and Revised J&K Bank Syllabus. 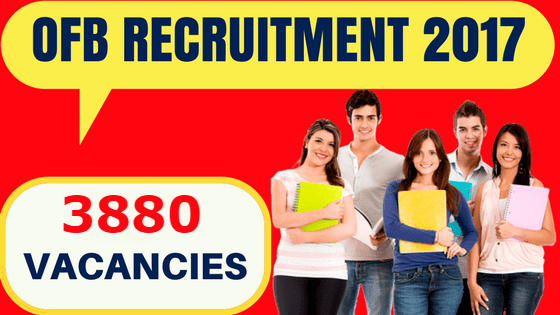 Who is eligible to apply for JK Bank Recruitment 2018? Candidates must be the permanent native of Jammu and Kashmir and hold the valid State Subject of J&K. If you are Government Job Aspirant and seeking Central Government Jobs, then we have some awesome news for you. 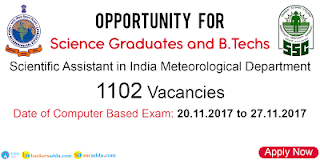 SSC has announced the recruitment of 1102 Scientific Assistant posts in Indian Meteorological Department and you will be surprised to know that Selection Process for these Group B Non-Gazetted posts comprises of Only Single Test, and there will be No Interviews. Applicants must note that Recruitment of Scientific Assistant is not a regular recruitment conducted by SSC, Last time the Recruitment was announced in 2011 and 2013, So this is the best time to get employed in Central Government Departments. As per the SSC Calendar 2017, this Notification for SSC Scientific Assistants was scheduled to be announced on 15th July, but for some time it was delayed and was finally announced on 18th July 2017. The Online Registration window opens from 8th July and you can submit your online form till 4th August 2017. If, you are willing to apply for these High Profile posts by SSC is Meteorological Department, then you should read this post till end and submit your online form before the Last, Not only the Notification, we will also discuss the Eligibility Criteria, Selection Process, Scheme of Exam and How of applying for SSC Scientific Assistant Exam 2017. Indian Ordnance Factory is a Bicentenary Government Industrial Organization under the Department of Defense Production, Ministry of Defence, Government of India. The objective of OFB, ie to ensure the self-reliant, indigenous, defense production capabilities of the nation.It is pertinent to mention here that there are 41 Ordnance Factories throughout India, with State of Art Defence Production Technology in various Filed.OFB had 1.64 Lakh Employees on its Rolls and is One of biggest Employer of Manpower in Indian next only to Railways and Banks. Recruitment for OFB's is done by Ordnance Factory Recruitment Center. Ordnance Factory Board had issued a Recruitment Notification and invites online applications for the post of Industrial Employees (Semi Skilled Workman). Total No. of vacancies that have been advertised is 3880. OFB Recruitment 2017 is being done for various Ordnance Factories located in various States in India.Deserving and Interested candidates may send their applications to the concerned authority in a prescribed format before the last date ie 26th June 2017. Aspirants who are searching for factory-related jobs in Government organization may prefer this opportunity and apply for these vacancies or we can say that All Eligible Indian Candidates who are interested in these Government jobs may apply for this recruitment process before the last date. Today in this post, we are going to share the latest vacancies of various Posts in Indian Ordnance Factory Board. Applicants who meet the eligibility criteria can submit online applications before the closing date. As per the notification, there are over 3880 vacancies and these vacancies have been notified by a well known Government organization called Indian Ordnance Factory Board. 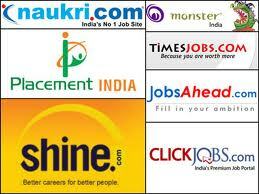 Its raining Government Jobs in India and this is the best time for you to Find and Apply for Government Jobs in India. Though, SSC Exams, IBPS Exams, UPSC Exams are regular affairs and announced as per their Calendar. However, the highest trending Government Job this Week is SSC CGL 2017 Exam, the Notification for which was announced on 15th May, 2017, after a delay of over 2 months. In our previous post we have already discussed about the SSC CGL 2017 Notification and In this post we will discuss about the Just announced Accounts Officers Jobs in National Fertilizers India. Unlike, SSC CGL Exams and other Government Exams, that are announced every year, National Fertilizers recruitment is not announced regularly and this is why it is a golden opportunity to apply for these jobs.In case, you didn't know much about National Fertilizers India, then we will provide you a brief Introduction of this Government Organization. 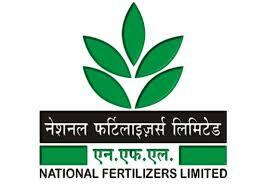 National Fertilizers Limited (NFL) : NFL is India's premier, Central Public Sector Undertaking, that is engaged in the Manufacturing and Marketing of Fertilizers in India. It is centrally funded and has attained the distinction of being a Mini Ratna. NFL Recruitment for Accounts Officers in a Golden opportunity for those seeking Officer Level Government Jobs in Central Departments and PSU's . SSC CGL 2017 : An Online Job Test for those, seeking Government Jobs in 2017 for Central Government Departments and Ministries in. Posts includes, Income Tax Inspector, Examiner, Divisional Accountant, Auditor, Assistant Audit officer and several other High profile posts. SSC CGL is one of the Most popular Exam for Government Jobs in India and next only to IBPS Exams, in terms of No. of candidates apply and appear for the exam. For the record, an average no. of 14 lakh candidates appear every year for this exam, but the no. of candidates who apply for this exam is pretty big. Yes, for 2016 CGL Exam, an all time high 38 lakh applications were received for CGL Exam and for CGL 2017 Exam, this no. may exceed 45 lakh. This no. is rising in the last few years, due to growing Love for Government Jobs in India. Moreover the High Salary, Security and facilities in a Government Job is unmatchable. As per the SSC Exam Calendar 2017, Notification for CGL 2017 was to be announced on 11th March, however, due to some administrative reasons, the Notifications get delayed and finally it was announced on 15th May, 2017 and Online Registration begin from 16th May. As far as Exam Dates are concerned, CGL 2017 Tier-1 Exams are scheduled from 1st to 20th August, and Moreover, an exam of CGL type, requires at least 6 months of preparation. So, it is always better to know the Notification and Exam Dates in advance, as you need a minimum time of six months for the preparation of this prestigious exam. If, you have appeared in the previous SSC CGL Exam in 2016 them you have little advantage over others, who will be appearing the CGL for the first time. SSC CGL is going to be very competitive in 2017, so its a wiser decision to start preparing for this exam right now. It is expected that there will be an increase of 4-5 lakh candidates for CGL 2017 Exam. This is because as there will be lakhs of people who complete their Graduation in 2017, and as such they will apply for CGL Exam, thereby adding more competition. Complete List of All the Upcoming Intelligence Bureau Jobs in 2017. If you love, Government Jobs, and particularly looking for Jobs in Central Government of India, then there is a good news for you, as Ministry of Home Affairs (MHA) will soon announce the Intelligence Bureau Recruitment 2017 for various posts. It is worth mentioning here that Intelligence Bureau (IB) is the India's Internal Intelligence system and one of the most prestigious Government Department is India, to work with. Intelligence Bureau, has been consistently recruiting manpower since 2012. The most popular IB Recruitment was announced in 2012 for 750 ACIO posts. and since then every year, IB is inviting applications for various posts. In 2016, IB had invited vacancies for Personal Assistants and Security Assistants posts and Now everyone is waiting for announcement of IB Recruitment 2017. Moreover, IB Recruitment is regular exercise since 2012. There is not an year in the last 6 years, when the IB Job Notification was not announced. So get read and gear up for Intelligence Bureau Recruitment 2017. Intelligence Bureau has Jobs for everyone, irrespective of Qualification. There are posts for 10th, 12th and Graduates.So, it doesn't matter,how much you are Qualified, there is a Job for you in this prestigious department. Moreover, the posts advertised by IB department are Direct Recruitment / Non-Interview posts. ie. you just have to Qualify the Written exam, Fall in the Merit and get Job in Ministry of Home Affairs (MHA). As, this Intelligence Bureau Recruitment is announced by Ministry of Home Affairs (MHA), there is every likelihood that it will get viral among Job seekers in India, as who does not want a Government Jobs in India's most prestigious department and this popularity of Jobs in Intelligence Bureau makes it one of the highly competitive Job tests in India. The moment the IB Notification is announced, it gets highly shared on Social Networking sites including Facebook and Whatsapp. The best thing about this Recruitment is the Pay-Scale. The IB Recruitment comes with Different Pay-scales for different posts. For instance for the post of Personal Assistants, the pay scale is Rs 9300- Rs 34800 (GP-Rs 4600). The means, that MHA is offering salary equivalent to Gazetted posts. Whenever the IB 2017 Notification is announced, the Detailed advertisement will be uploaded on the Official website of MHA and same can be had from the Employment Newspaper . However, if you don't want to buy the Employment Paper and opening the Official Website, as everything is explained very well in this post, all you need to do is to read this post, till end. As per the information given in Budget 2017, there are 2.83 lakh vacancies that will be filled till March, 2017 and these are All Central Government Jobs. The Departments, that have maximum no. of vacancies are Police, Income Tax, Custom & Excise Department. But you must be eager to know about the No. of vacancies in the Home Ministry. As per the information, there are 6076 New Jobs, will be created in the Ministry of Home Affairs. Some of these posts, Like that of Assistants, will be filled through the Upcoming SSC CGL 2017 Exam and for another post, the Ministry may invite applications and it is expected that there will be Bumper vacancies for various Posts in Intelligence Bureau too. For Exact No. of vacancies and Actual Date of IB recruitment Notification, we have to wait for some time. SSC CGL 2017 Exam Dates have been announced, and the Notification will be tentatively scheduled to be announced on 11th March, 2017.This means, there is less, than 1.5 months time, for the notification to be announced. Did you know, that SSC Combined Graduate Level Exam is one of the Most Popular Exams in India, the reason is it opens doorway for Thousands of Government Jobs. This is the reason that whenever the SSC CGL Notification is announced, its gets viral in no time. The competition level is the CGL Exam is so high, there are 500 candidates competing for every single post in CGL Exam. So, if you are willing to appear in the upcoming SSC CGL 2017 Exam, then you should start your preparation right now, as there is not much time left for the exam. If you are a College pass out and looking for Government Jobs in 2017, then SSC CGL 2017 must be your dream chase. Moreover, it is expected that there , will be Bumper vacancies, for CGL 2017 Exam. Although the exact no. of vacancies, will be known only after the announcement of Notification. but as per the information, an approximate no. of 20,000 Jobs may be announced. The Big thing ie Notification for the SSC CGL 2017 will be out on 11th March, 2017. Advertisement will be published in the weekly Employment Newspaper, while the E-Version of Advt (* pdf format) can be downloaded from the SSC's Official Website. How To Prepare for SSC CGL Exam 2017 ? How and Where to Find Government Jobs in India in No Time ? Looking for Government Jobs in India in 2017-18. This Page has all the information you need. How to Get Government Jobs in India Quickly ? Getting a Government Job is a top priority among the educated youth of India. Since a government job offers high job security, fair incentives and a good working environment it is natural to look for a Government Job instead of the private sector. There are many opportunities and various sectors like banks, railways etc where one can apply for a Government Job but beware of the touts who promise a Government Job in return of a large sum. Don’t be carried away by their false promises as a Job in the Government sector can be secured by applying to the requisite sector and getting selected on the basis of merit. Find Out Why Getting a Govt Job is Easy in 21st Century ? Now a days it is very simple to apply for a Government Job than a Decade ago. As with the advancement in technology, the various Government departments release online forms. SSC : Storehouse of Government Jobs in India. If, you are looking for Government Jobs in 2017-18, then you should particular focus on exams conducted by SSC, reason is that SSc is the largest recruiter for Government Jobs in India. At least SSC conducts the Recruitment for 1 lakh vacancies and approximately screens 1 croce candidates in a year. The most popular among SSC Exams are SSC CGL and SSC CHSL Exam. How Jobs Portals Can help you in Getting your Dream Job ? The much awaited SSC CHSL 2016 Tier-1 Online Exams are going to start from 7th Jan, 2017. Earlier, there were speculations, that SSC might postpone the CHSL Exam, but ending all rumours, SSC had released a Notification on 8th Dec, 2016, confirming, that there is No change in the already announced schedule and CHSL Exams will be held from 7th Jan to 5th Feb, 2017. Now, the next Question is From when the SSC CHSL 2016 Admit Cards can be downloaded. Those, who are waiting for the arrival of admit cards at the home addresses are informed that SSC had discontinued issuing Paper Admit cards to candidates. Now the only way to get the Admit cards is to downlaod its. and that too from the Regional SSC Websites. The process from shifting to Online Mode of Exams and E-Hall tickets is to reduce the Paperwork both for the commission (SSC) and students. Moreover, Online Mode of exams, not only reduce the manual work, but also speed up the process. In this post, we will discuss the step-by step methodology for downloading the Hall Tickets for SSC CHSL 2016 Exam. Don't get confused as Hall Tickets, Call Letter and Admit Cards are the different names of Admission Certificate that you need to appear for the SSC CHSL Exam. As, all you known that only few days are left for the CHSL Exam, therefore it is high time, that you go through your SSC CHSL 2016 Syllabus and immediately buy these Concept clearing books for SSC CHSL Exam. When CHSL 2016 Hall Tickets can be downloaded ? This can be the best and the most awaited Employment News of 2016 and particularly for Bank Job aspirants. Today, Reserve bank of India (RBI) had announced its Recruitment Notification and invited applications for over 600 Assistant posts. It is worth mentioning here that RBI Assistant Recruitment is a regular exercise from the last 5-6 years. RBI Assistant Recruitment Notification 2016 is a dream come true for many, as this is the one of the most favourite jobs for banking aspirants in India and ray of hope especially for those, that have missed to apply for IBPS Exams. The Notification, regarding the Recruitment of 610 Assistants in RBI, is released online on 7th November, 2016 and Detailed Advt. is available on the Official website of RBI. For Offline, readers, Detailed, RBI Recruitment Notification will be published in the Upcoming Employment Newspaper. Earlier, RBI had placed a Notification on its Official website, regarding the changes in Syllabus and Exam Pattern for Recruitment of assistants and this Recruitment Notification comes with latest changes in exam pattern. This RBI Recruitment for the post of Assistants, is a lifetime opportunity for those who are graduates, as getting an Assistant Job in India's Top Bank, is the best priority among Bank Job seekers. Today, in this post, we are going to share the Complete Details of RBI Assistant Recruitment 2016. Applicants are advised to read this post till end and also download the Detailed Advt from the link given at the end of this post. Why Assistant Jobs in RBI ? 1) As RBI is the banker of the Bank and as such there is no public dealing for Assistants, as we have it in Public Sector Banks. 2) The Salary is much higher than those appointed as Assistants in Public Sector Banks. Plus, Assistant in RBI enjoy many other perks and Benefits Eg. The Clerks in PSB's are paid a monthly Salary of Rs 16000 (Approx. ), while the Salary of Assistant in RBI is Rs 32000 (approx). 3) Since, RBI is the Bankers of the Banks, it is the most favourite Job Destination among Job-Seekers in India. Free Registration to apply for Jobs in ICICI,HDFC and Axis Banks : Explained ? Welcome to Recrutiment Portal !